Today we saw the last qualifications of the Women's pair, Mixed pair and Men's group. The first pair on the floor were Russia’s Elena Kabina and Ksenia Sidelnikova. A vibrant routine after 0.3 deduction scored 27.080. A total for this Women’s Pair is 80.410 and although they are in the 6 place, we will not see them do their combined routine again, as only one pair per country can qualify. To be able to qualify for the final they had 85.950 to beat – which is the score of the leaders of the Women’s Pair competition – the other Russian pair, defending World Champions Double Daria's scored a total hard to beat, that was topped by today’s 29.530 for their combined routine. The pair from Democratic People’s Republic of Korea with difficulty value of 2.570 for their combined routine scored 28.470 and with a total of 84.895, losing a 1.000 to Russia qualified from the 2nd place. Combined routine of the Israeli pair was awarded a score of 28.100 and with a total of 84.845, only 0.05 behind the Korean pair they qualified from the third position. Ukrainian pair with Pylypiak and Tabachynska who in the 2017 European Age Group competition won gold for their tempo routine in 13-19 Age Group enter the finals from the 4th place. Today girls presented more dynamic, almost comical routine, than their other routines and scored 27.670 which is just enough for the final. The American pair scored their highest score in this competition for their qualifying combined routine, great 27.980. With a total of 82.740 they enter the final in the 5th place. The last 6th spot in the finals is taken by the Portuguese Pair. Girs who also competed in the 13-19 division in the 2017 European Age Group Competition did a solid routine and scored27.280 which was enough for a 7th position in the qualifiers. As 6th place was taken by the second Russian pair they are not eligible for the final and it is Portugal who will perform their combined routine again. The Chinese Mixed Pair opened the final qualifying round in this event. They scored solid 27.955, which is their highest score in this World Championships and qualified from the 7th position. The top of the ranking belongs to the Eastern Europe! Once again Marina Chernova and Georgii Pataraia amazed the crowd. 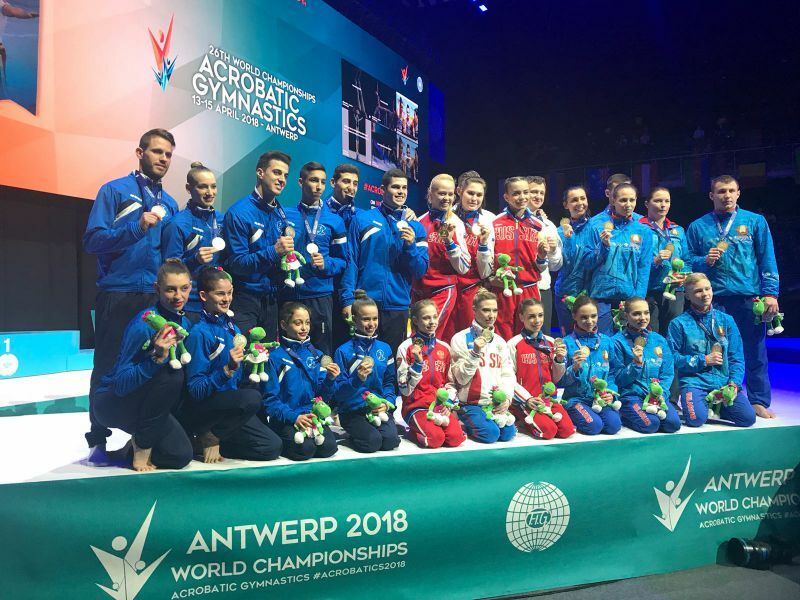 With no surprise to anyone, the defending World Champions and World Games Champions qualified for the finals from the first position with a massive advantage of 4 points over the 2nd position. Their today’s routine had the highest difficulty among all Mixed pairs 3.290 . The had a small deduction of 0.3 and the combined routine score, 29.940 is actually their lowest score in this World Championships (the only one under full 30 points), but still the highest of all Mixed pairs. . In both 2nd and 3rd place were the Belarusian pairs. World Games silver medallists Artur Beliakou and Volha Melnik did a powerful routine with the difficulty value of 2.520 and scored 29.170. 29.230 was the score awarded for the combined routine to Kasyan and Evstafeev. The 0.06 difference topped their advantage of 0.16 after first two qualifying rounds and it is Hanna and Konstantin who we will see in the finals. Azerbaijan fell in one of their combos and didn’t manage to outscore Gurbanli and Al-Mashaykhi, who qualified for the finals with a total score of 84.530. This time the roles reversed as Nurjan and Aghasif won silver in 12-18 competition in Putian and Ruhidil and Abdulla did not make the finals. It only proves that Azerbaijan is becoming a strong player in the Mixed Pair’s game. 5th in the qualifications ranking are Marte Snoeck and Bram Roettger. 13-19 European Age Group Competition winners performed a lyrical routine to a medley of various different melodies and scored beautiful 28.330. Netherlands Britney & Stein did another emotional routine and qualified from the 6th place, meaning that we won’t see Fenne and Stef in the finals. In the final we will also see the Chinese pair as well as the French and Polish teams. It is the first final for Poland in a senior competition since 2014 Championships in Levallois. Well done to all finalists. In the Men’s Group event we can only see 6 out of 9 groups competing in this event and of course only one per country. Other than the other categories, this event was watched in silence, interrupted only by rounds of applause. 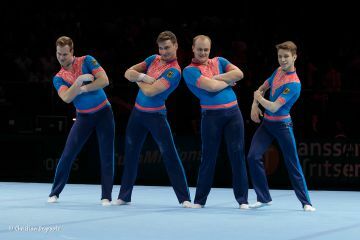 Russia’s group of Grechukhin,Nabiev, Pchelnikov and Shkvarok opened the Men’s Group event. Once again their routine did not go as planned. After 1.200 deducition for their balance and 1.600 penalty today for the combined exercise they are closing the rankings of Men’s Groups in the 9th position. This competition featured a very surprising turn of events. The defending Champions from Putian, China’s Li Zheng, Rui Liuming, Zhang Teng and Zhou Jiahuai will not get a chance to defend their title as they’ve lost the leading position to the other team from China - Fu Zhi, Guo Pei, Jiang Heng and Zhang Junshuo who will now have the chance to become World Champions if they perform as good as in the qualifiers. The defending leaders actually scored more for their combined routine 30.350, but did not manage to even their disadvantage of yesterday’s unlucky tempo routine. One point behind the Chinese group with 88.260 total is the Group from Israel. World Games bronze medallists, Lidar Dana, Yannay Kalfa, Efi Efraim Sach and Daniel Uralevitch scored 29.490. One of their balance elements looked unstable and the base made a few steps to save it, but they manage to stabilize and continued without any further interruptions. Third qualifier is the group from Portugal, first time performing in the Senior competition at World Championships competition. Their combined routine to Moonlight Sonata silenced the Lotto arena and scored this fantastic group amazing 29.710. As we won’t see the current World Champions in the finals, Russia, 5th after the qualifying competition takes the 4th spot in the finals. German Kudriashov, Alexander Sorokin Valeriy Tukhashvili and Kirill Zadorin executed their routine very precisely today and managed to score 29.930. If they manage to repeat that performance in the final, they can also have good chances for a medal. Belgian group performed a fantastic routine of Michael Jackson impressions and scored 29.290. Especially the top of the group Patel absolutely rocked Jackson’s dance moves and together with Anthoon, Garre and Geusens moonwalked their way into the finals. Boys got the standing ovation from the Belgian fans for whom they are already the winners. The final spot in the finals was taken by Germany. Once again they proved they got the moves and are a fantastic group of entertainers. Another amusing choreography from this group scored 27.590 and with a total of 82.430 we will also see their combined routine again.